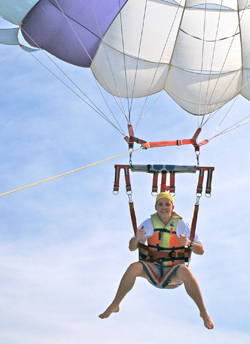 Fun Pictures Online can help you capture your customers as they enjoy a special parasail flight with your company. Every moment of your customers flight is special, from take off to landing. By capturing their pictures and displaying them on your web site, for your customers and all their friends to view, you will boost your web site visits and add potential new clients to your client list. Parasailing offers you an unique opportunity to photograph your customers because no one else can. You can capture those special moments and provide your customer an unique view of themselves flying on your parasail, a view that is captured and only available on your web site. Visit one of our many Parasail Companies, Ranalli Parasail and see a how partnering with Fun Pictures Online can benefit your company.